Before I came to Japan, back in the days when I had a real job and I got paid a real salary, I took a few of my vacations to Belgium. One of the reasons was that I liked Belgian beer. I rented a car and drove all over Wallonia (southern Belgium) and especially the area called the Ardennes. I visited three of the towns where famous Trappist beers are made: Rochefort, Chimay and Orval. All three of these beers are sold in Tokyo. And all three are damned good. The countryside near Orval is pretty. I love Belgium (even though the Belgian guy at Cisco didn't want to hire me!?%&#'"&%). The country is green and quiet with rolling hills. One can speak and hear French, which is truly a beautiful language. One eats well (French cuisine with German portions). And above all, one drinks well (over 400 kinds of beer). Orval is an interesting and peculiar brew: it has not only the usual brewers yeast, but also the somewhat wild, oft present in Burgundy, brettanomyces yeast, which imparts a tart, somewhat "funky" character that nonetheless delivers deliciousness (うまみ!?). 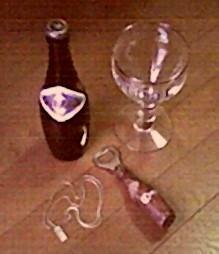 Ever since, Orval has been associated with the symbol of a trout with a golden ring in its mouth. The necklace you see above has this very symbol, as does the reverse of the Orval glass goblet. You can, of course, drink the brew at a nearby inn. And Orval has some magnificent ruins in addition to the neo-romanesque new abbey. What is a Trappist anyway? The reason I got interested in Orval and Belgian beer was that I was a homebrewer. You can buy homebrewing equipment and ingredients at Tokyu Hands (although I hear that it's illegal - funny how that works in Japan).